Nothing is more inviting than a beautiful fireplace. It’s usually the focal point of the room. In fact, when selling a family home, the fireplace is one of the focus areas for potential buyers. During the colder months, it serves as a gathering place for friends and family to enjoy each other. But an outdated fireplace can quickly become an eyesore. Continue reading for easy to implement fireplace makeover ideas. Paint is always a budget-friendly option for any home makeover ideas. But did you know you could also update your fireplace using paint? Paint can be the most budget-friendly way to update a fireplace; Especially when you are trying to makeover a brick floor to ceiling fireplace. White is one of the most popular colors and instantly brightens up a room. 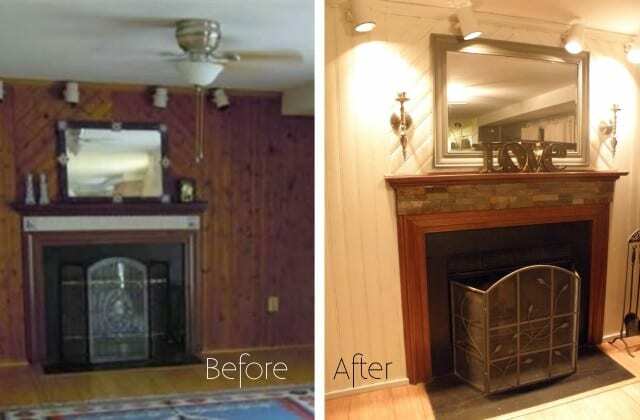 This fireplace makeover on Sarah Joy Blog is a great example of what a little paint can do. She even has a tutorial and supply list on her blog. Check out her tutorial here. 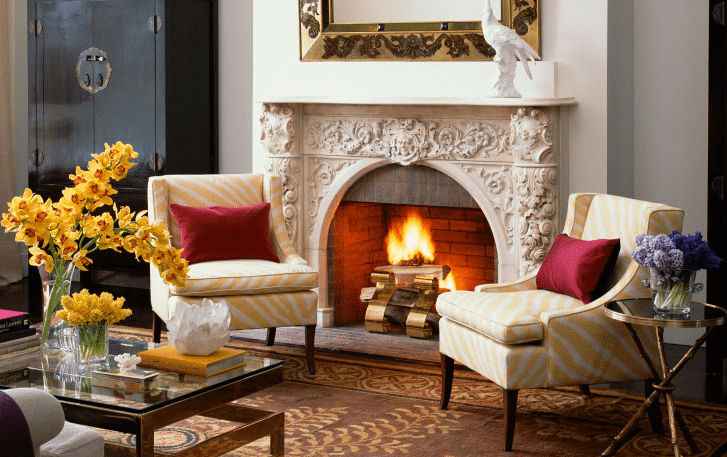 Whitewashing is also an excellent way to update a fireplace. The technique is a little different but the Life on Shady Lane Blog has the full tutorial for you here. Black has even been trending on Instagram in the last year. 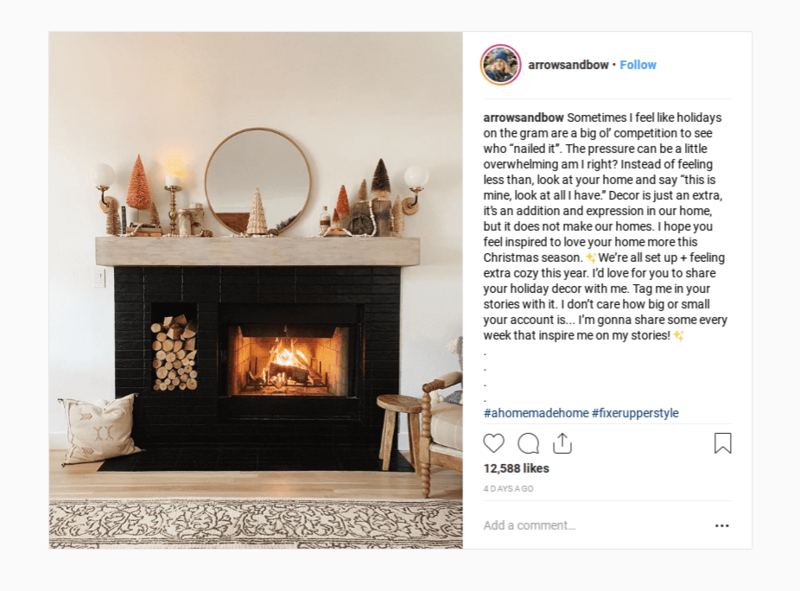 When Ashley Petrone (@arrowsandbow) painted her fireplace black, her followers were a little taken aback. But after it was completed and the decor was up, it creates an incredible backdrop for the roaring fire. This may sound like it could be very expensive and need a master craftsman but this project just needs a few tools and a lot of enthusiasm. The idea behind this mantel was to spend as little as possible. 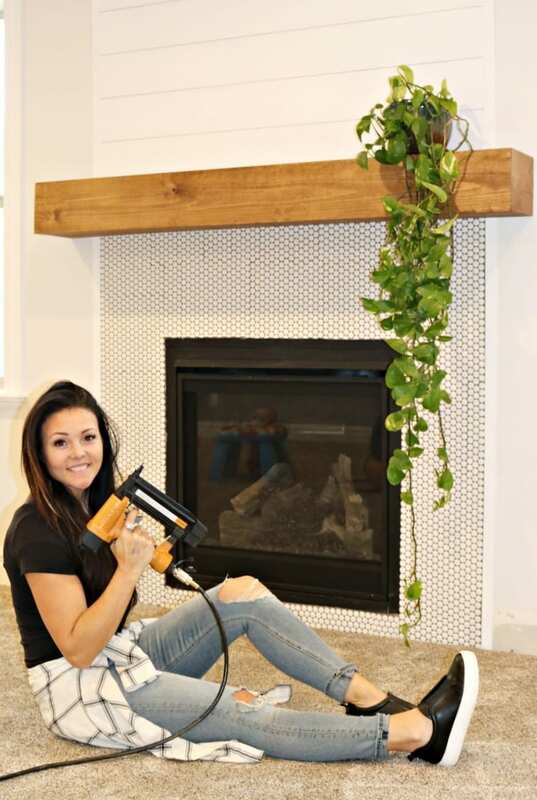 This DIY-er knew she wanted a solid wood mantel but the cost of one single piece of wood would costs hundreds and she was not gonna spend that kind of money. This mantel is actually four pieces of wood nailed and glued together. This project came in at only $35! What a deal. You can check out her full tutorial and supply list here. 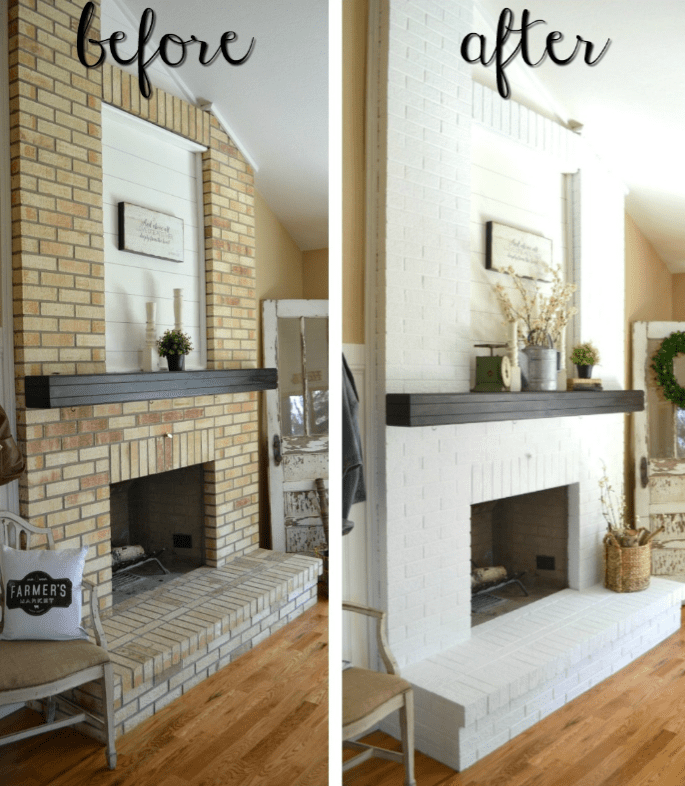 This outdated fireplace got a makeover by changing out the tile. After the owners painted the wall behind the fireplace, they knew the title needed a facelift to bring it into this decade. The owners removed the old time and replaced the new themselves for just under $50. It may cost you a little more if you have to rent the tools but the update shows what a great investment it is. Check out how they did it here. This fireplace had a mantel that just blended in with the rest of the brick. By attaching a wooden mantel over the existing brick, the contrasting wood against the whitewashed fireplace makes for a very cozy corner. The holidays are a great time to highlight a fireplace. Add height to your space with bold floral arrangements or a mirror on the mantel. Bring in the holidays with cute little Christmas trees on the mantel and a vintage barrel to hold your firewood. Adding a few plants to your fireplace can give your home a bohemian vibe instantly. Add a couple of comfy chairs to enjoy the warm fire. Fireplaces are a selling point this time of year. 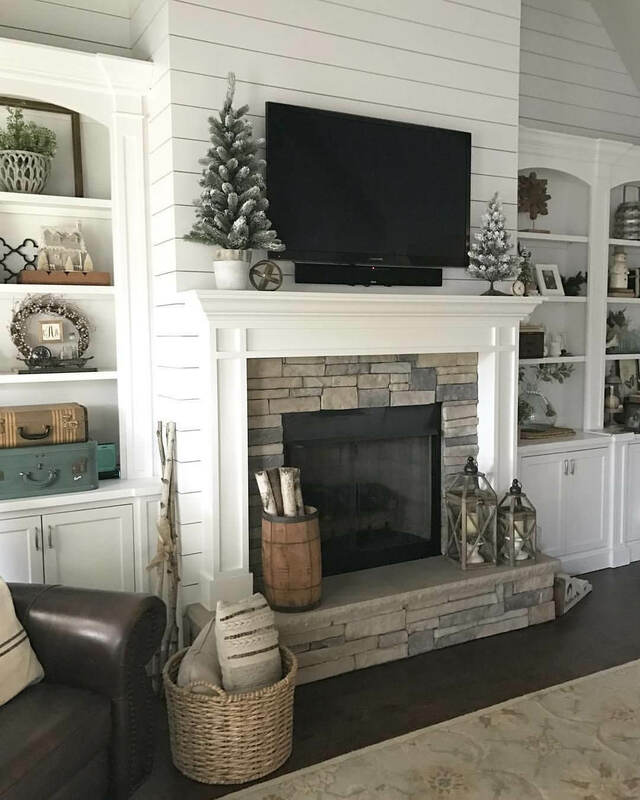 But whether you are selling your home or not, these budget-friendly tips should give you some inspiration to make your fireplace stand out while staying on budget.